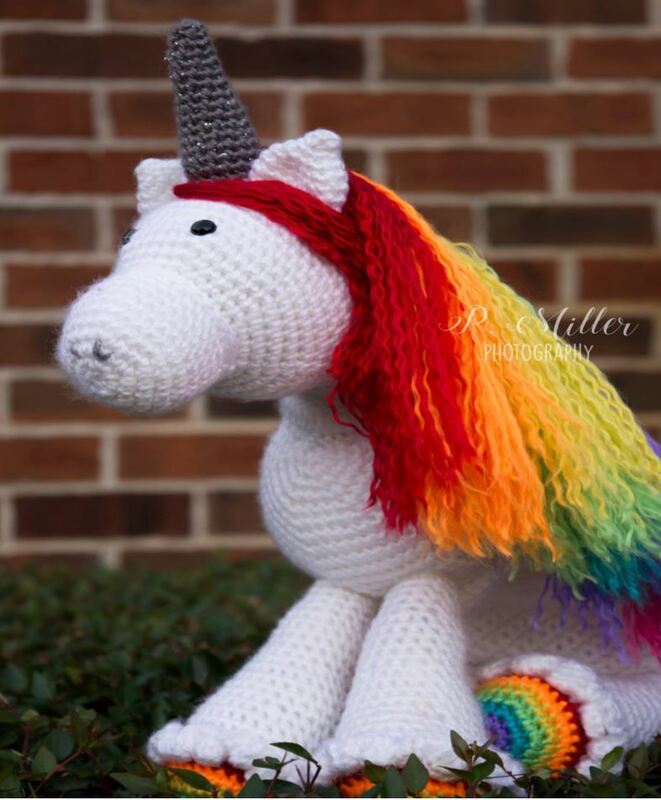 “THE ORDER OF THE UNICORN” Pattern Collection! There are FIVE coordinating pieces available! 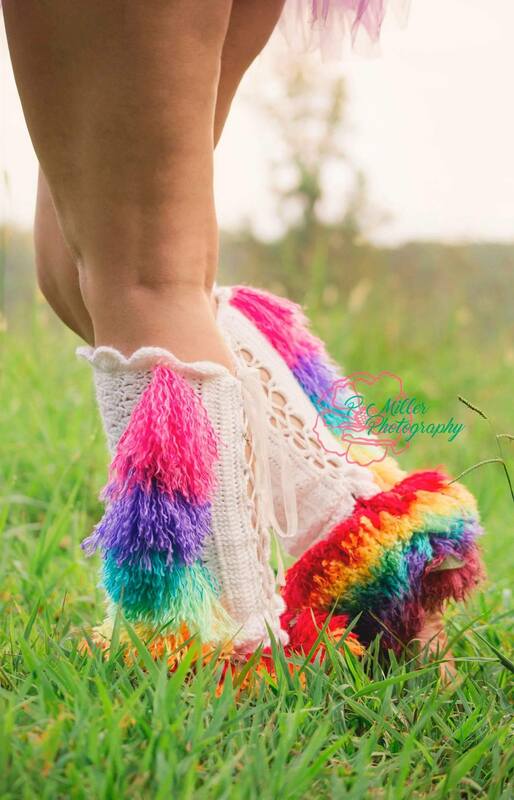 Be all the unicorn you can be, check out all of the them! 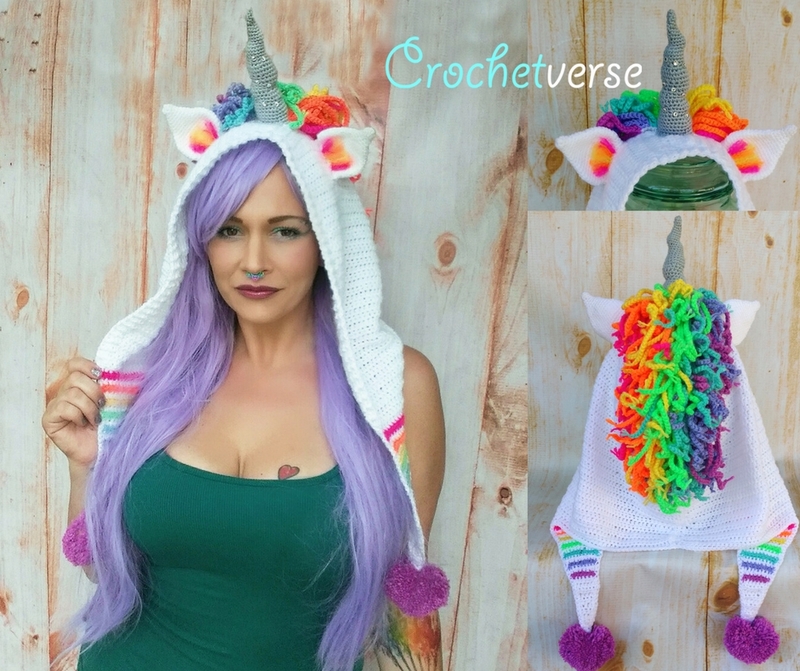 This Ode to Artax Unicorn Hood and many other fun patterns (many free! ), can be found here! 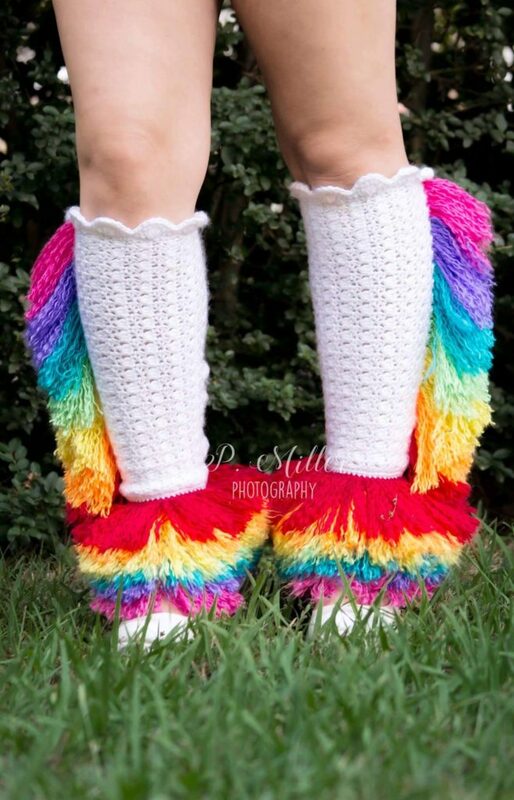 Want the matching Free Unicorn Tail Pattern? Find that right below now! 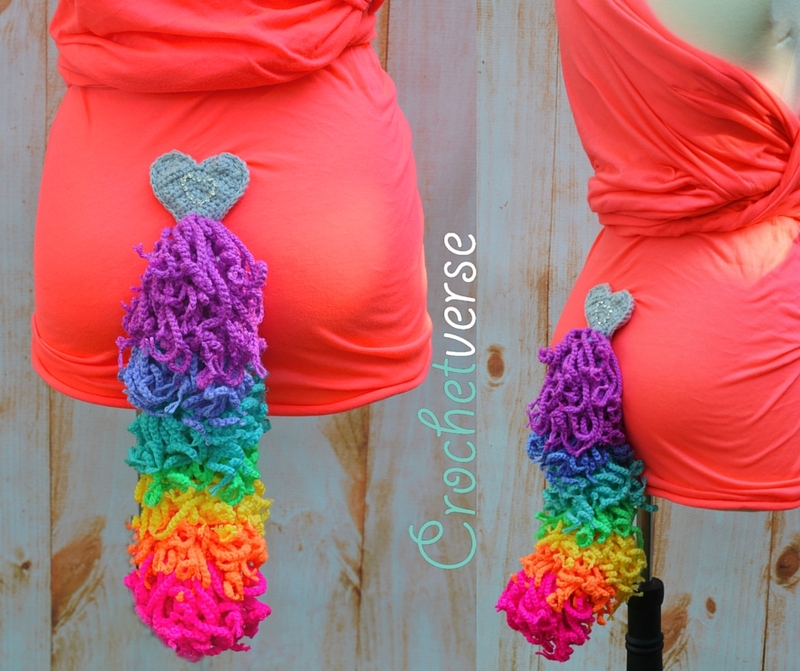 Look at this curly rainbow dream of a tail! Here is how to make your own! – DK weight yarn in the following colors and amounts. The below link is an affiliate link, and I share it with you in full confidence in both product and customer support and service. Deramores is my chosen source each time I employ the Stylecraft DK, with a huge color range & fabulous pricing, I can promise you won’t be sorry, be sure to check it out! The base tube measures about 13” long. Rounds 1-11 of the pattern = about 4” tall. While gauge is not extremely important, you do need to be as close as possible so the finished tail is not too long or the stitches are not too loose. **DESIGN NOTE: So as to keep the tail from stretching under the weight of all the fringe, we will work DOUBLE STRANDED throughout. Treat the 2 strands as one in regards to working back loop only. HDCBLO: half double crochet as normal but in the BACK LOOP ONLY. Note, that there will actually be two strands of yarn in your back loops because we are working double stranded. TREAT THE TWO STRANDS AS ONE for the piece. 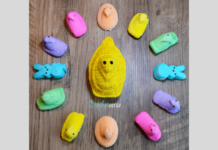 Each color will cover 3 rounds of 16 sts each, except the final color (tip of tail) color which will have 2 rounds of 16 and 2 rounds of 8 at the bottom tip. Therefore, cut 48 strands of each color. Each should measure about 1.5yards long each. I measured for a few until I got the feel for it, then eyeballed the rest! I cut only color at a time so I didn’t have to worry about stopping and coming back later to find my little humans had found them and played with them. Ha! Keep in mind that the colors on round 35 or the open end of the tail will be the furthest end of the tail, hanging the lowest. The colors on round 1 or the closed tip end will sit on the body and be the top end. I chose to do my rainbow in reverse, pink at the lowest, magenta at the top. If you do not want this, REVERSE your order. Step 1: Insert your hook from above to below (from the open end down to the tip end) behind the remaining free loop that is unworked due to us working in the BACK loop only in our rounds. Step 2: Fold a strand of the fringe in half, and lay the looped end over the end of the hook, then pull the loop through the stitch. Step 3: Treating both tail ends of the strand as one, chain 20-25 (a little variance is ok!) as you normally would. ROW # COLOR/SKIP? ROW # COLOR/SKIP? Row 12-14: Repeat as for Rows 9-11, tie off. To make it an even more solid attachment point for the tail, we will now crochet the two hearts together so they are double thickness. Step 1: Lay the hearts on top of each other, so that the wrong sides are touching and facing in, right sides are facing out. Step 2: Treating both thicknesses as one, insert the hook anywhere around (through both hearts), ch 1, sc around the post of each stitch at the end of each row around the heart, sl st across the 2 sts at the center bottom dip of the two humps of the heart, make 3 sc in the same st at the bottom tip of the heart, sl st to the 1st sc made, tie off leaving an 18” tail to seam the tail to the heart. Step 3: Using the tail from the heart, stitch the pointed end of the fringed tail (round 1 of the base tube) near the bottom tip point of the heart. I stitched in a circular fashion, catching each of the 8 stitches from round 1 of the base tube, securing them to the heart. See photo for placement guidance. 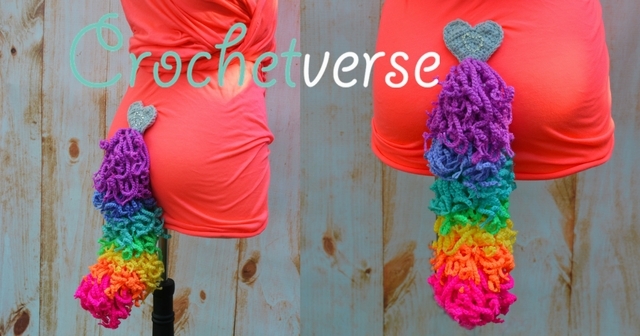 Now you can pin or stitch on velcro to attach to your unicorn outfit! I would obviously LOVE to see your work, please show me on my Facebook page linked below and check out all the other designs too. And follow…cuz I try to do cool stuff ALL the time! Step 1: Using a length of wire about 20” long, and a pair of needlenose pliers, bend one end around into a circle or loop 2-3 times, until the loops are about the size of a dime in diameter. This is so when the wire is inserted in the tail, it will not poke through. Step 2: Insert that looped end up into the tail towards the tip now stitched to the heart base. Take the wire that is poking out from the bottom, and bend that into multiple circles in a similar fashion as before until it is short enough to fit inside the tail tube. Step 3: Using the tail from round 35 of the tail tube, stitch the opening closed. Do this back and forth 3 times so that the wire is securely inside the tail and will not poke out. Using the E6000 glue, sparingly apply it to a toothpick end. Then, touch the toothpick to the back of a rhinestone (it should nicely pick it up for you). Place the rhinestone where you like on the heart base and roll the toothpick away, leaving the glue and rhinestone in place on the heart base. Repeat until you have applied as many or few crystals as you like. Previous articleFree Pattern- Romanian Crochet Cord Motivation Bracelet – Reach Goals & Learn New Skills! Next articleWoolbur!! Look at this BEST book ever for the Crochet and Yarn Obsessed! You know Artax was a horse, not a unicorn, right? 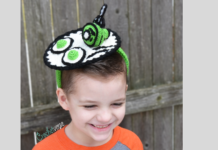 thank you for the pattern, gonna make a great unicorn for halloween. just wanted to point out that you reference a photo that isn’t attached in your directions. If you tell me what spot it is at, I can review and be sure to add it. 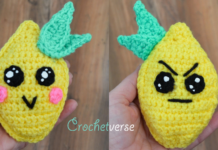 OR, if you are stuck at any point, email me at info@crochetverse.com for help!